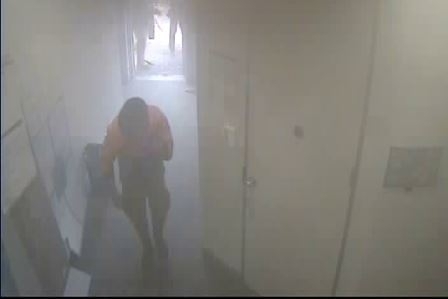 CCTV shows one of the tradies rushing in to save people trapped by the Springvale bank fire. Police say they may recommend bravery awards to the two tradies who rushed into Springvale’s burning Commonwealth Bank to save people trapped inside. At a press conference on Friday 25 November at the Victoria Police Centre in Docklands, Detective Inspector Michael Roberts appealed for the two men to come forward. He said they may hold vital information and that the people they saved want to be able to thank them. One was in his early twenties and another in his late twenties and was wearing a chequered shirt. Inspector Roberts said the police may also officially recognise their quick thinking and heroic actions. CCTV camera captures rescue effort. CCTV shows the men entering through the rear of the bank and smoke becomes increasingly thick. He said the two men were able to open one of the bank’s internal doors which had trapped at least 10 staff and customers. “(Those inside) were having difficulty opening it, for some reason,” he said. Among the people rescued was the man who is thought to have set himself on fire. Inspector Roberts praised the men and said many people were grateful for what they did. He also said they may hold vital information for investigators. “Their actions are nothing short of heroic, and that’s is exactly why we want to speak to them. “Apart from anything else, we want to obtain their version of events. “But the reality is we want to acknowledge the heroic actions and so do the people who were there at the time. “They want to know who these people are and be able to say thank you to them. He said five people remained in The Alfred hospital a week after the incident, including the man who was thought to have started the blaze. He remains in a critical condition under police guard and had not yet been interviewed by police. Inspector Roberts said one other person was at Dandenong Hospital. One of the other victims remains in a critical condition.